Traditionally, scarecrows were set up in gardens and fields to keep unwanted birds — particularly crows, away from the crop. Now people are making scarecrows for their annual autumn Halloween decorations. Instructions are easy! 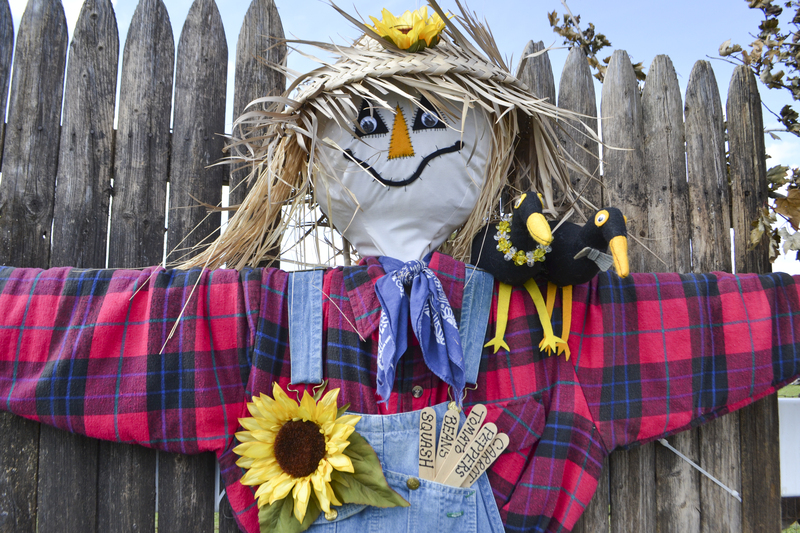 Homemade scarecrows can be quite fashionable and eye-catching. Choose bold colors and set up a display with corn stalks and bales of hay. Get creative, get the kids involved, use your imagination and make a scary scarecrow! The more menacing he looks, the more of a conversation piece he will be. You might be able to find a pumpkin patch with a scarecrow building all set up for you like we did in these photos. But if not I have a few videos below to guide you through building your own or even buying a pre-made scarecrow . Building this one was easy since we found a kid’s one piece pajamas we could stuff with hay and use real pantyhose for the head. After we had that all set up we just glued the eyes and mouth on with pointed vampire fangs because this one is a vampire scarecrow. Here is ours that we made – Maybe you can suggest a name for him ?